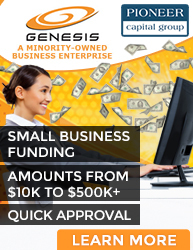 Genesis Networks & Pioneer Capital Group can provide the capital you need to reach your business goals! As an added value to our members, Genesis/Pioneer will provide you with a no cost, no obligation quote on your credit card processing fees. Typical clients see significant cost saving. These offers can help you make money and save money!